Energy companies dominated a list of the worst-performing S&P 500 stocks in 2015. Here are the 10 stocks down the most for the year. We bet you could have guessed: energy companies were the worst performing stocks in 2015. The S&P 500 Index fell 0.7% in 2015, which was better than the 7% decline the benchmark index hit in September following a summer of volatility but far short of the 11% gain it reached for 2014. Global markets were roiled in 2015 due to slowing growth in China and much of Europe, prompting a slump in commodity prices and oil's continuous plunge. Geopolitical concerns in the Middle East weighed heavily, and are likely to do so into 2016. U.S. markets also had to endure the added uncertainty of whether or not the Federal Reserve would raise interest rates. It did. "Volatile and lackluster," Jeff Kravetz, investment director of the Private Client Reserve of U.S. Bank, told TheStreet earlier Thursday. "It's been overall a disappointing year for investors, and I think a lot of that was due to the high volatility that we experienced over the summer and then more recently with the Fed on and off." The Fed's decision to raise rates finally came to fruition in December, when the federal funds rate was increased by a quarter of a point. The first rate marked the first increase by the U.S. central bank in nearly a decade. 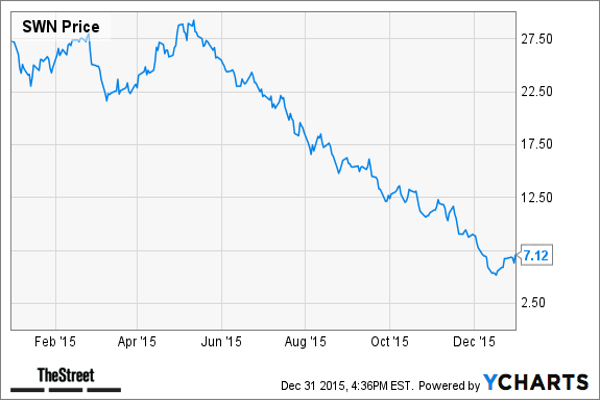 Oil continued its decline in 2015 from 2014, taking energy stocks along for the slide. 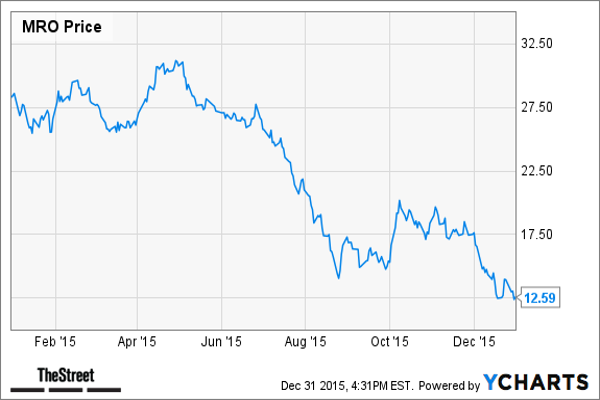 West Texas Intermediate crude oil has tumbled more than 30% this year. Brent crude oil is down 35% this year. 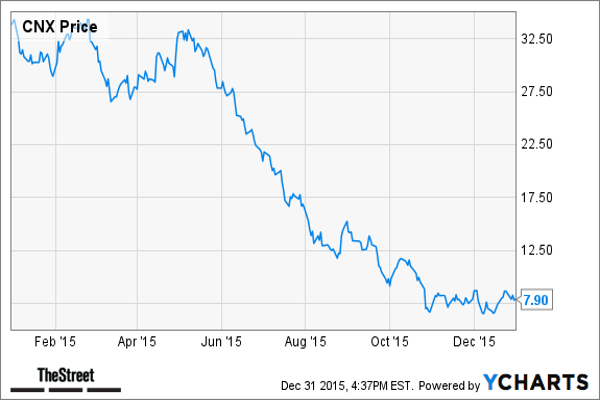 And analysts say that oil prices will continue to stay low in 2016. No surprise then that a list of the worst-performing stocks in the S&P 500 this year was dominated by energy stocks. 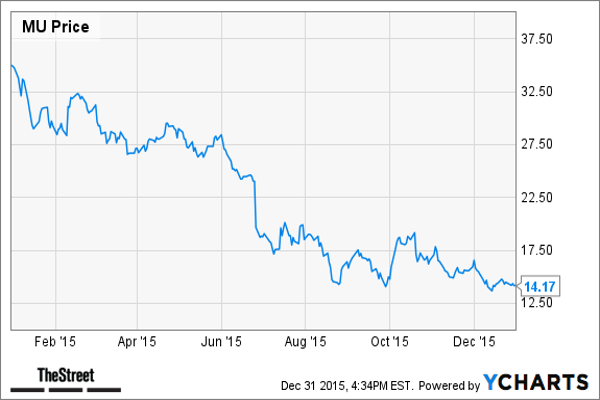 Can you guess which stock had the worst performance in 2015? Here's the list of worst-performing stocks in 2015, paired with ratings from TheStreet Ratings, TheStreet's proprietary ratings tool. Buying an S&P 500 stock that TheStreet Ratings rated a buy yielded a 16.56% return in 2014, beating the S&P 500 Total Return Index by 304 basis points. Buying a Russell 2000 stock that TheStreet Ratings rated a buy yielded a 9.5% return in 2014, beating the Russell 2000 index, including dividends reinvested, by 460 basis points last year. When you're done be sure to check out the tech stocks that will kill your portfolio in 2016. We rate MARATHON OIL CORP (MRO - Get Report) as a Sell with a ratings score of D+. This is driven by some concerns, which we believe should have a greater impact than any strengths, and could make it more difficult for investors to achieve positive results compared to most of the stocks we cover. The company's weaknesses can be seen in multiple areas, such as its deteriorating net income, disappointing return on equity, weak operating cash flow, generally disappointing historical performance in the stock itself and feeble growth in its earnings per share. The company, on the basis of change in net income from the same quarter one year ago, has significantly underperformed when compared to that of the S&P 500 and the Oil, Gas & Consumable Fuels industry. The net income has significantly decreased by 273.8% when compared to the same quarter one year ago, falling from $431.00 million to -$749.00 million. Return on equity has greatly decreased when compared to its ROE from the same quarter one year prior. This is a signal of major weakness within the corporation. Compared to other companies in the Oil, Gas & Consumable Fuels industry and the overall market, MARATHON OIL CORP's return on equity significantly trails that of both the industry average and the S&P 500. Net operating cash flow has significantly decreased to $496.00 million or 72.04% when compared to the same quarter last year. In addition, when comparing the cash generation rate to the industry average, the firm's growth is significantly lower. Despite any intermediate fluctuations, we have only bad news to report on this stock's performance over the last year: it has tumbled by 51.36%, worse than the S&P 500's performance. Consistent with the plunge in the stock price, the company's earnings per share are down 346.66% compared to the year-earlier quarter. Naturally, the overall market trend is bound to be a significant factor. However, in one sense, the stock's sharp decline last year is a positive for future investors, making it cheaper (in proportion to its earnings over the past year) than most other stocks in its industry. But due to other concerns, we feel the stock is still not a good buy right now. MARATHON OIL CORP has experienced a steep decline in earnings per share in the most recent quarter in comparison to its performance from the same quarter a year ago. This company has reported somewhat volatile earnings recently. We feel it is likely to report a decline in earnings in the coming year. During the past fiscal year, MARATHON OIL CORP increased its bottom line by earning $1.41 versus $1.32 in the prior year. For the next year, the market is expecting a contraction of 186.2% in earnings (-$1.22 versus $1.41). We rate MURPHY OIL CORP (MUR - Get Report) as a Sell with a ratings score of D. This is driven by several weaknesses, which we believe should have a greater impact than any strengths, and could make it more difficult for investors to achieve positive results compared to most of the stocks we cover. The company's weaknesses can be seen in multiple areas, such as its deteriorating net income, disappointing return on equity, weak operating cash flow, generally disappointing historical performance in the stock itself and feeble growth in its earnings per share. The company, on the basis of change in net income from the same quarter one year ago, has significantly underperformed when compared to that of the S&P 500 and the Oil, Gas & Consumable Fuels industry. The net income has significantly decreased by 749.3% when compared to the same quarter one year ago, falling from $245.71 million to -$1,595.43 million. Return on equity has greatly decreased when compared to its ROE from the same quarter one year prior. This is a signal of major weakness within the corporation. Compared to other companies in the Oil, Gas & Consumable Fuels industry and the overall market, MURPHY OIL CORP's return on equity significantly trails that of both the industry average and the S&P 500. Net operating cash flow has decreased to $552.44 million or 38.22% when compared to the same quarter last year. In addition, when comparing the cash generation rate to the industry average, the firm's growth is significantly lower. Despite any intermediate fluctuations, we have only bad news to report on this stock's performance over the last year: it has tumbled by 53.78%, worse than the S&P 500's performance. Consistent with the plunge in the stock price, the company's earnings per share are down 710.59% compared to the year-earlier quarter. Naturally, the overall market trend is bound to be a significant factor. However, in one sense, the stock's sharp decline last year is a positive for future investors, making it cheaper (in proportion to its earnings over the past year) than most other stocks in its industry. But due to other concerns, we feel the stock is still not a good buy right now. MURPHY OIL CORP has experienced a steep decline in earnings per share in the most recent quarter in comparison to its performance from the same quarter a year ago. This company has reported somewhat volatile earnings recently. We feel it is likely to report a decline in earnings in the coming year. During the past fiscal year, MURPHY OIL CORP increased its bottom line by earning $5.71 versus $4.69 in the prior year. For the next year, the market is expecting a contraction of 160.5% in earnings (-$3.46 versus $5.71). We rate NRG ENERGY INC (NRG - Get Report) as a Hold with a ratings score of C. The primary factors that have impacted our rating are mixed - some indicating strength, some showing weaknesses, with little evidence to justify the expectation of either a positive or negative performance for this stock relative to most other stocks. The company's strengths can be seen in multiple areas, such as its good cash flow from operations and notable return on equity. However, as a counter to these strengths, we also find weaknesses including unimpressive growth in net income, poor profit margins and a generally disappointing performance in the stock itself. NRG ENERGY INC has experienced a steep decline in earnings per share in the most recent quarter in comparison to its performance from the same quarter a year ago. This company has reported somewhat volatile earnings recently. But, we feel it is poised for EPS growth in the coming year. During the past fiscal year, NRG ENERGY INC turned its bottom line around by earning $0.21 versus -$1.22 in the prior year. This year, the market expects an improvement in earnings ($0.30 versus $0.21). Net operating cash flow has increased to $934.00 million or 25.53% when compared to the same quarter last year. Despite an increase in cash flow, NRG ENERGY INC's average is still marginally south of the industry average growth rate of 26.81%. Regardless of the drop in revenue, the company managed to outperform against the industry average of 7.0%. Since the same quarter one year prior, revenues slightly dropped by 3.0%. Weakness in the company's revenue seems to have hurt the bottom line, decreasing earnings per share. We rate MICRON TECHNOLOGY INC (MU - Get Report) as a Hold with a ratings score of C+. The primary factors that have impacted our rating are mixed - some indicating strength, some showing weaknesses, with little evidence to justify the expectation of either a positive or negative performance for this stock relative to most other stocks. The company's strengths can be seen in multiple areas, such as its largely solid financial position with reasonable debt levels by most measures and attractive valuation levels. However, as a counter to these strengths, we also find weaknesses including feeble growth in the company's earnings per share, deteriorating net income and poor profit margins. The current debt-to-equity ratio, 0.60, is low and is below the industry average, implying that there has been successful management of debt levels. MU, with its decline in revenue, underperformed when compared the industry average of 9.6%. Since the same quarter one year prior, revenues fell by 26.7%. Weakness in the company's revenue seems to have hurt the bottom line, decreasing earnings per share. The gross profit margin for MICRON TECHNOLOGY INC is currently lower than what is desirable, coming in at 25.34%. It has decreased significantly from the same period last year. Along with this, the net profit margin of 6.14% significantly trails the industry average. Net operating cash flow has decreased to $1,120.00 million or 29.64% when compared to the same quarter last year. In addition, when comparing the cash generation rate to the industry average, the firm's growth is significantly lower. We rate KINDER MORGAN INC (KMI - Get Report) as a Hold with a ratings score of C. The primary factors that have impacted our rating are mixed - some indicating strength, some showing weaknesses, with little evidence to justify the expectation of either a positive or negative performance for this stock relative to most other stocks. Among the primary strengths of the company is its expanding profit margins over time. At the same time, however, we also find weaknesses including a generally disappointing performance in the stock itself, feeble growth in the company's earnings per share and generally higher debt management risk. 46.56% is the gross profit margin for KINDER MORGAN INC which we consider to be strong. It has increased from the same quarter the previous year. Along with this, the net profit margin of 5.01% is above that of the industry average. Despite the weak revenue results, KMI has outperformed against the industry average of 36.8%. Since the same quarter one year prior, revenues fell by 13.6%. Weakness in the company's revenue seems to have hurt the bottom line, decreasing earnings per share. Despite any intermediate fluctuations, we have only bad news to report on this stock's performance over the last year: it has tumbled by 60.85%, worse than the S&P 500's performance. Consistent with the plunge in the stock price, the company's earnings per share are down 75.00% compared to the year-earlier quarter. Despite the heavy decline in its share price, this stock is still more expensive (when compared to its current earnings) than most other companies in its industry. KINDER MORGAN INC has experienced a steep decline in earnings per share in the most recent quarter in comparison to its performance from the same quarter a year ago. Earnings per share have declined over the last two years. We anticipate that this should continue in the coming year. During the past fiscal year, KINDER MORGAN INC reported lower earnings of $0.95 versus $1.15 in the prior year. For the next year, the market is expecting a contraction of 26.3% in earnings ($0.70 versus $0.95). We rate FOSSIL GROUP INC (FOSL - Get Report) as a Hold with a ratings score of C. The primary factors that have impacted our rating are mixed - some indicating strength, some showing weaknesses, with little evidence to justify the expectation of either a positive or negative performance for this stock relative to most other stocks. The company's strengths can be seen in multiple areas, such as its attractive valuation levels, expanding profit margins and largely solid financial position with reasonable debt levels by most measures. However, as a counter to these strengths, we also find weaknesses including deteriorating net income, weak operating cash flow and a generally disappointing performance in the stock itself. The gross profit margin for FOSSIL GROUP INC is rather high; currently it is at 56.72%. Regardless of FOSL's high profit margin, it has managed to decrease from the same period last year. Despite the mixed results of the gross profit margin, the net profit margin of 7.45% trails the industry average. FOSL, with its decline in revenue, underperformed when compared the industry average of 12.4%. Since the same quarter one year prior, revenues fell by 13.8%. Weakness in the company's revenue seems to have hurt the bottom line, decreasing earnings per share. Net operating cash flow has significantly decreased to -$28.01 million or 166.04% when compared to the same quarter last year. In addition, when comparing to the industry average, the firm's growth rate is much lower. The company, on the basis of change in net income from the same quarter one year ago, has significantly underperformed when compared to that of the S&P 500 and the Textiles, Apparel & Luxury Goods industry. The net income has significantly decreased by 44.5% when compared to the same quarter one year ago, falling from $103.72 million to $57.53 million. We rate FREEPORT-MCMORAN INC (FCX - Get Report) as a Sell with a ratings score of D. This is driven by some concerns, which we believe should have a greater impact than any strengths, and could make it more difficult for investors to achieve positive results compared to most of the stocks we cover. The company's weaknesses can be seen in multiple areas, such as its deteriorating net income, generally high debt management risk, disappointing return on equity, weak operating cash flow and generally disappointing historical performance in the stock itself. The company, on the basis of change in net income from the same quarter one year ago, has significantly underperformed when compared to that of the S&P 500 and the Metals & Mining industry. The net income has significantly decreased by 793.8% when compared to the same quarter one year ago, falling from $552.00 million to -$3,830.00 million. Currently the debt-to-equity ratio of 1.89 is quite high overall and when compared to the industry average, suggesting that the current management of debt levels should be re-evaluated. Along with this, the company manages to maintain a quick ratio of 0.46, which clearly demonstrates the inability to cover short-term cash needs. Return on equity has greatly decreased when compared to its ROE from the same quarter one year prior. This is a signal of major weakness within the corporation. Compared to other companies in the Metals & Mining industry and the overall market, FREEPORT-MCMORAN INC's return on equity significantly trails that of both the industry average and the S&P 500. Net operating cash flow has significantly decreased to $822.00 million or 57.32% when compared to the same quarter last year. In addition, when comparing the cash generation rate to the industry average, the firm's growth is significantly lower. Despite any intermediate fluctuations, we have only bad news to report on this stock's performance over the last year: it has tumbled by 67.39%, worse than the S&P 500's performance. Consistent with the plunge in the stock price, the company's earnings per share are down 775.47% compared to the year-earlier quarter. Naturally, the overall market trend is bound to be a significant factor. However, in one sense, the stock's sharp decline last year is a positive for future investors, making it cheaper (in proportion to its earnings over the past year) than most other stocks in its industry. But due to other concerns, we feel the stock is still not a good buy right now. We rate SOUTHWESTERN ENERGY CO (SWN - Get Report) as a Sell with a ratings score of D. This is driven by a number of negative factors, which we believe should have a greater impact than any strengths, and could make it more difficult for investors to achieve positive results compared to most of the stocks we cover. The company's weaknesses can be seen in multiple areas, such as its deteriorating net income, generally high debt management risk, disappointing return on equity, weak operating cash flow and generally disappointing historical performance in the stock itself. The company, on the basis of change in net income from the same quarter one year ago, has significantly underperformed when compared to that of the S&P 500 and the Oil, Gas & Consumable Fuels industry. The net income has significantly decreased by 924.2% when compared to the same quarter one year ago, falling from $211.00 million to -$1,739.00 million. The debt-to-equity ratio of 1.05 is relatively high when compared with the industry average, suggesting a need for better debt level management. Along with this, the company manages to maintain a quick ratio of 0.47, which clearly demonstrates the inability to cover short-term cash needs. Return on equity has greatly decreased when compared to its ROE from the same quarter one year prior. This is a signal of major weakness within the corporation. Compared to other companies in the Oil, Gas & Consumable Fuels industry and the overall market, SOUTHWESTERN ENERGY CO's return on equity significantly trails that of both the industry average and the S&P 500. Net operating cash flow has significantly decreased to $287.00 million or 50.51% when compared to the same quarter last year. In addition, when comparing the cash generation rate to the industry average, the firm's growth is significantly lower. Despite any intermediate fluctuations, we have only bad news to report on this stock's performance over the last year: it has tumbled by 76.80%, worse than the S&P 500's performance. Consistent with the plunge in the stock price, the company's earnings per share are down 870.00% compared to the year-earlier quarter. Naturally, the overall market trend is bound to be a significant factor. However, in one sense, the stock's sharp decline last year is a positive for future investors, making it cheaper (in proportion to its earnings over the past year) than most other stocks in its industry. But due to other concerns, we feel the stock is still not a good buy right now. We rate CONSOL ENERGY INC (CNX - Get Report) as a Sell with a ratings score of D. This is driven by a few notable weaknesses, which we believe should have a greater impact than any strengths, and could make it more difficult for investors to achieve positive results compared to most of the stocks we cover. The company's weaknesses can be seen in multiple areas, such as its disappointing return on equity, weak operating cash flow, generally disappointing historical performance in the stock itself and generally high debt management risk. Return on equity has greatly decreased when compared to its ROE from the same quarter one year prior. This is a signal of major weakness within the corporation. Compared to other companies in the Oil, Gas & Consumable Fuels industry and the overall market, CONSOL ENERGY INC's return on equity significantly trails that of both the industry average and the S&P 500. Net operating cash flow has significantly decreased to $110.07 million or 62.43% when compared to the same quarter last year. In addition, when comparing the cash generation rate to the industry average, the firm's growth is significantly lower. CNX's stock share price has done very poorly compared to where it was a year ago: Despite any rallies, the net result is that it is down by 75.43%, which is also worse that the performance of the S&P 500 Index. Investors have so far failed to pay much attention to the earnings improvements the company has managed to achieve over the last quarter. Naturally, the overall market trend is bound to be a significant factor. However, in one sense, the stock's sharp decline last year is a positive for future investors, making it cheaper (in proportion to its earnings over the past year) than most other stocks in its industry. But due to other concerns, we feel the stock is still not a good buy right now. CNX's debt-to-equity ratio of 0.79 is somewhat low overall, but it is high when compared to the industry average, implying that the management of the debt levels should be evaluated further. Even though the debt-to-equity ratio shows mixed results, the company's quick ratio of 0.28 is very low and demonstrates very weak liquidity. CONSOL ENERGY INC reported significant earnings per share improvement in the most recent quarter compared to the same quarter a year ago. The company has demonstrated a pattern of positive earnings per share growth over the past year. However, we anticipate underperformance relative to this pattern in the coming year. During the past fiscal year, CONSOL ENERGY INC increased its bottom line by earning $0.73 versus $0.35 in the prior year. For the next year, the market is expecting a contraction of 147.9% in earnings (-$0.35 versus $0.73). We rate CHESAPEAKE ENERGY CORP (CHK - Get Report) as a Sell with a ratings score of D. This is driven by multiple weaknesses, which we believe should have a greater impact than any strengths, and could make it more difficult for investors to achieve positive results compared to most of the stocks we cover. The company's weaknesses can be seen in multiple areas, such as its deteriorating net income, generally high debt management risk, disappointing return on equity, weak operating cash flow and generally disappointing historical performance in the stock itself. The company, on the basis of change in net income from the same quarter one year ago, has significantly underperformed when compared to that of the S&P 500 and the Oil, Gas & Consumable Fuels industry. The net income has significantly decreased by 803.9% when compared to the same quarter one year ago, falling from $661.00 million to -$4,653.00 million. The debt-to-equity ratio is very high at 2.71 and currently higher than the industry average, implying increased risk associated with the management of debt levels within the company. To add to this, CHK has a quick ratio of 0.67, this demonstrates the lack of ability of the company to cover short-term liquidity needs. Net operating cash flow has significantly decreased to $318.00 million or 72.63% when compared to the same quarter last year. In addition, when comparing the cash generation rate to the industry average, the firm's growth is significantly lower. Despite any intermediate fluctuations, we have only bad news to report on this stock's performance over the last year: it has tumbled by 78.32%, worse than the S&P 500's performance. Consistent with the plunge in the stock price, the company's earnings per share are down 2823.07% compared to the year-earlier quarter. Naturally, the overall market trend is bound to be a significant factor. However, in one sense, the stock's sharp decline last year is a positive for future investors, making it cheaper (in proportion to its earnings over the past year) than most other stocks in its industry. But due to other concerns, we feel the stock is still not a good buy right now.